New Power Aerated spray gives you High Pressure Massage force and reduces water consumption, saving your Water and Money. Use EcoSwitch Spays Button and the Water saving Trickle saving more. Experience the best ultimate shower experience, all without wasting a drop of water or money. 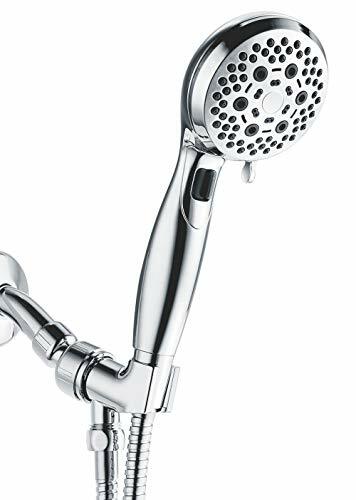 This Handheld anti-leak design showerhead is made of high quality Durable ABS and CHROME finish all over- never tarnish and resisting spots. ANGLE-ADJUSTABLE OVERHEAD BRACKET Lets you point hand shower where you want it for hands-free operation at desired angle .Super-FLEXIBLE Long 60 Inch STAINLESS STEEL HOSE, Great for washing kids and pets. One finger Control easily snap into place to identify spray modes. 11 different setting and combinations provide a total customized shower experience. Ecospray Push Button and Water Saving Pause Mode is great for saving water in RVs and boats. High quality brown gift box Each box contains a Premium Handheld Shower Shower Hose Overhead Bracket Free Teflon Tape, Additional Water Filter flow restrictor that is easy to install and remove. Installation Manual and Warranty. Detailed easy-to-follow Installation Manual makes the installation process trouble-free and perfect! Ergonomic Grip Handle with water saving Ecoswitch Button, reduce water flow in any setting to save while shampooing, shaving, or bathing kids and pets. Three-zone click-lever dial, water saving trickle keep your shower warm while you shave or shampoo. ANGLE-ADJUSTABLE OVERHEAD BRACKET for perfect flow direction. EXTRA-FLEXIBLE long premium 60 inch STAINLESS STEEL HOSE: Durable Heavy-duty design, Easy clean kids, pets and your shower. 74 Angled nozzles provide a wide spray. Anti-clogging and touch-clean nozzle. Angle adjustable swivel ball joint. POWERFUL HIGH PRESSURE OXYGENIC SPRAY: 2.5gpm flow control. New Power Aerated spray infuse water with oxygen and increase power give you High Pressure massage force even under low water pressure.New Wasserflow tech also improve water force by more efficiently channeling water. SAVING WATER SAVING MONEY: With our New Aerated Spray, Ecoswitch sprays and water saving trickle dial, you will save water and money. INSTALL in minutes on any standard shower arm. Easy Tool-Free connection. YOU SHOP, WE GIVE! SAVE WATER, SAVE WORLD! When you shop Wassern Showerheads on Amazon, we list low prices for high quality products with the added bonus that we will donate 0.5% of the purchase price to Charity: Water. Every cent matters. Clean water can change everything! If you have any questions about this product by Wassern, contact us by completing and submitting the form below. If you are looking for a specif part number, please include it with your message.